This franchise is the Ronseal of movies - it does what it says on the tin You know exactly what you're going to get - the only grounds for complaint would be not enough of it. This one doesn't disappoint. Bruce Willis reprises the role of New York Detective John McClane who always happens to be in the right place at the right time to save the city and the world from impending doom. This fourth iteration of the series contains the usual sado-masochistic beating of the indestructible cop who simply gets up and carries on when even your average super-hero would call it a day. The plot is updated and centres on cyber-terrorism meted out in revenge by a former government security programmer Thomas Gabriel (Timothy Olyphant) who has been shunned by his former employer. The plot is quite simple - a 'fire sale'. A three stage plan to shut down transport, communication and utilities that leave the country in chaos and black out - and all on the 4th of July. The narrative arc is provided by McClane's estranged daughter Lucy (May Elizabeth Winstead) who is reconciled to her hero-dad at the climax of the film. McClane also saves the nation and kills Gabriel - in the most bizarre of ways. There are plenty of chases, shoot-outs, explosions, computer geek conversations and people simply refusing to die. Most of the film is set in Washington DC but it starts in New York and ends up in West Virginia. 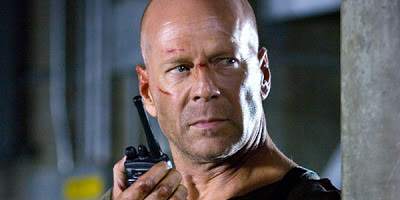 McClane's inventiveness reaches new heights as he takes out helicopters, trucks and the Air Force's lastest fighter jet. I didn't find much cinematically to comment on and as regards the plot it's a bit thin but allows some engagement with moral questions over government power and it abuse, our reliance on a virtual world to run the real one and cyber terrorism. As I said, it does what it says on the tin. I wonder how many more the ageing Mr Willis can make? If you want an action movie that demands little form it's viewers then this is good - fire up the popcorn. I won't hurry to see number 5, although seeing Moscow get CGI trashed might be interesting. I'll give this 6/10. I was stuck in a hotel and this was the late night offering on TV - just about the right context to watch it in.